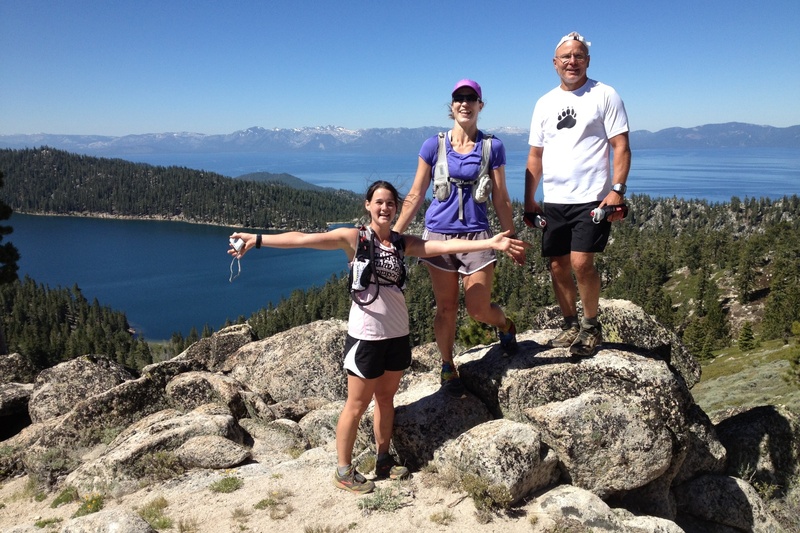 Last weekend I ran the spectacular 50k course on the Tahoe Rim Trail for the second time. It was a beautiful day on an amazing course supported by so many energetic people. First I will describe the course, then I will write about my experience out on the trail and at the finish line. The motto of the Tahoe Rim Trail endurance runs is “A Glimpse of Heaven, a Taste of Hell.” And, indeed, the course is either heavenly or hellish, with little in-between. Mileage caveat: all mileage in the courses description below is approximate and based on either GPS or my rough estimation. My GPS has measured the course at 34+ miles (or 54+ k) both times I have run it. I have heard similar reports from other runners, so adjust your expectations accordingly. The race starts and finishes alongside Spooner Lake, a short walk downhill from the Nevada State Park parking and restrooms. The course starts slightly downhill on a wide dirt road and almost immediately turns to the right onto North Canyon Rd. North Canyon Rd. climbs gently for less than a mile until the Marlette Lake Trail turnoff. Click here to view a video of the 50 Mile & 50k start on the event’s Facebook page. All distance runners follow this same route up to Tunnel Creek Aid station and the Red House Loop. The 100-mile racers start an hour earlier than the 50-mile and 50k runners, so there is plenty of space for everyone once you hit the single track. Side note: North Canyon Rd. parallels the Marlette Lake Trail all the way to Hobart Rd. at Marlette Lake. Mountain bikes are not allowed on the Markette Lake Trail, so bicycle access to the very popular Flume Trail is via North Canyon Rd. 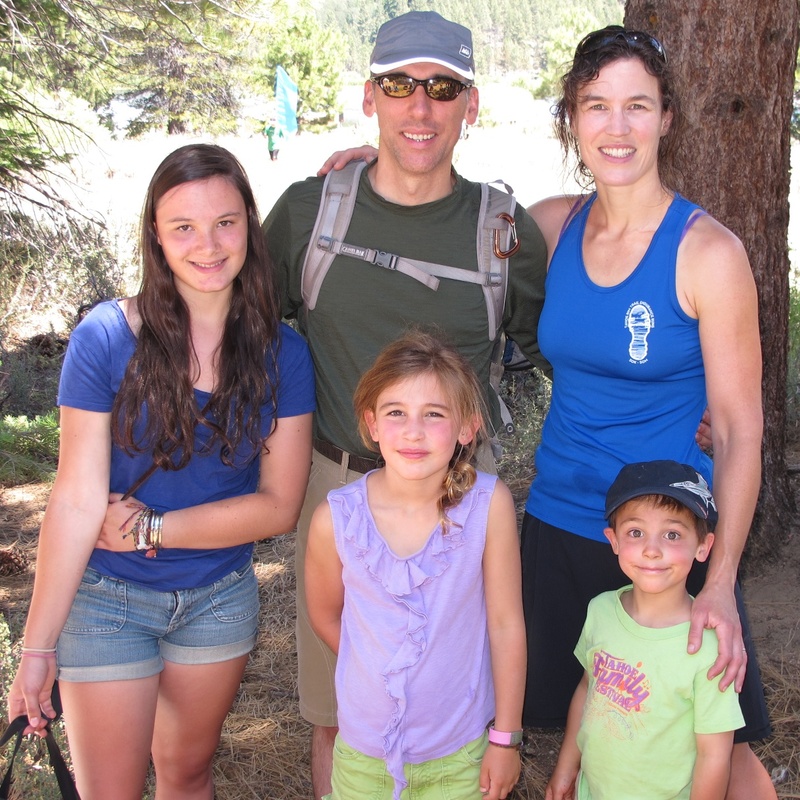 The Marlette Lake Trail is 4 miles of lovely single track through the forest filled with pine, fir and aspen trees. 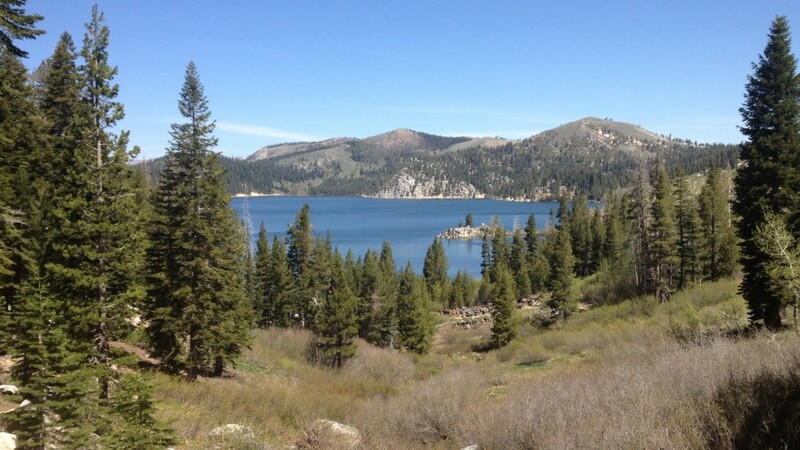 The first 3.5 miles climb about 1000 feet, then the trail descends 300 feet in the final half mile to Marlette Lake. The climb up Marlette Lake Trail is runnable for strong trail runners, but I generally hike it, as it is just the start of a long day. As you climb, there is a clearing in the second half where you can look up and see the antennae atop Snow Valley Peak – Boy Scouts at the aid station will greet you by name there at 9200 feet much later in the day. On the short descent to Marlette Lake you’ll enjoy the first of many views of this pristine alpine reservoir. The course turns right at the end of the Marlette Lake Trail onto Hobart Rd. I’ve seen this road labelled on maps as Hobart Rd., Marlette Lake Rd, and also as the continuation of North Canyon Rd. I’ll call it Hobart Rd. here, because it ends up at the Hobart Aid Station. Note: turning left on Hobart Rd. takes you around Marlette Lake to the famous Marlette Flume Trail, which is not part of the course. The Tahoe Rim Trail splits into two forks around either side of Marlette Peak. 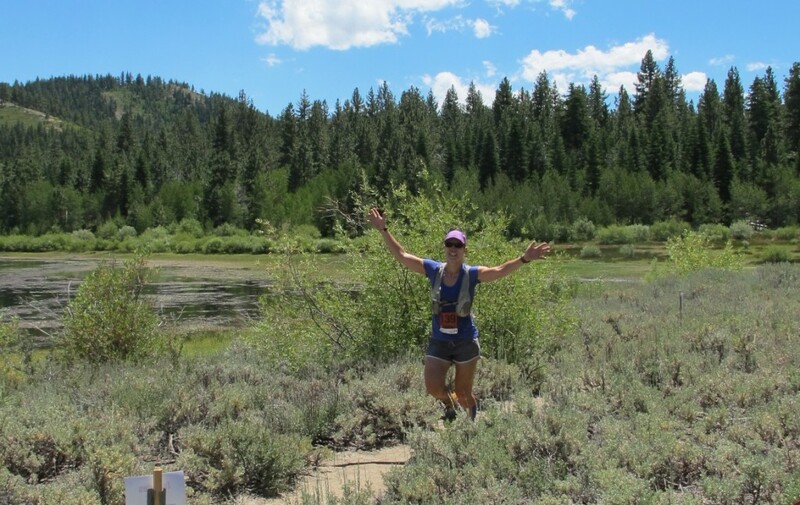 The course takes the west fork that features stunning views of Marlette Lake perched high above Lake Tahoe – that famous “Glimpse of Heaven” as described by the race organizers. The east fork passes by Marlette Peak Campground before rejoining the primary trail. “Glimpse of Heaven” on a training run with friends from the Wrong Distance Runners of Sacramento. After Marlette Peak, the Tahoe Rim Trail takes you for a long and pleasant downhill cruise through shady forest and granite rocks until you reach a dirt road and the small twin lakes. The lakes are more like large mud puddles and hardly memorable – you may not even notice them off to your left. Continue about 1/4 mile more to the Tunnel Creek Aid station – be sure that you stay on the singletrack Tahoe Rim Trail all the way to the aid station – do not take the dirt road to the left. The Tunnel Creek Aid station is a major crossroads and it is helpful, if not necessary, to have a good understanding of the race course at this point. 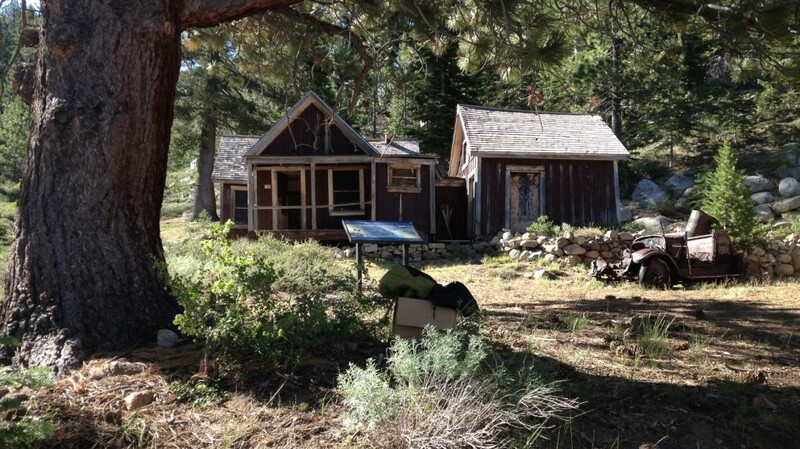 The 50k course returns to Tunnel Creek after the Red House Loop, then heads back on the Tahoe Rim Trail as described below. Racers doing the 50-mile and 100-mile course will return here several times and head off in different directions. Make sure you are leaving Tunnel Creek headed in the right direction! The 50k course leaves Tunnel Creek station for the Red House Loop downhill on a steep, rocky dirt road. It starts off fairly level on sandy crushed granite and then plunges down for that “Taste of Hell” promised by event organizers. The Red House Loop is about 6.5 miles on dirt roads and the (not-so-famous) Red House Flume. The Red House Flume is a less-exotic version of its famous sister, the Marlette Flume. It offers about 2 miles of very runnable, very slightly uphill running on single track until it loops back to the brutally steep dirt road back to Tunnel Creek Aid Station. Honestly, I could barely walk up this hill and desperately wanted to just stop and sit down on one of the many granite rocks alongside the road. The hub of activity at Tunnel Creek Aid Station was a very welcome sight. Leaving Tunnel Creek Aid Station the second time, the 50k course follows the Tahoe Rim Trail back up and around Marlette Peak, through the Hobart Aid Station, up to Snow Valley Peak, then down to the Spooner Lake trailhead. Again, runners must be sure that they leave the station in the right direction. This section is long and mostly uphill to Snow Valley Peak. Though the very steepest sections of the course are behind you, the mileage already on the legs is enough to reduce many to hiking this long section. The return on the TRT backtracks about 6 miles before you pass the Hobart Aid Station and then take the TRT up to Snow Valley Peak (instead of heading back on Hobart Rd. which come up from Marlette Lake). Again, the angel and devil characters pointed us in the right direction. The signage leaving Hobart Aid Station states that it is 2.6 miles to Snow Valley Peak. I really believe it is at least 3.5 miles, and yes, it is all uphill. Thank goodness this section of trail is really gorgeous, because it really is a long haul up the hill. Then you think you’re at the top, but the trail actually continues uphill above the treeline. It is beautiful and you feel like Julie Andrews (“Climb Every Mountain”) but you’re definitely not singing and dancing! More great views await you. Back on the west side of the ridge you’ll once again see Marlette Lake floating high above Lake Tahoe. Then finally you descend briefly as you approach the Snow Valley Aid Station, staffed by earnest boy scouts who greet you by name. My favorite feature at this aid station was the bucket of ice water with sponges for a cold dousing before headed down the long and toasty final stretch. From Snow Valley Peak the course descends toward the Spooner Summit Trailhead of the TRT. And though it is 95% downhill, it’s not a cakewalk when you already have a marathon of miles on the legs. I recommend that you return to this section of the TRT some day and run it on fresh legs – the trail surface is excellent crushed granite single track and the views of Lake Tahoe and Desolation Wilderness are spectacular. After following the trail downhill for what seems like an eternity, you hear the sounds of Highway 50 and you will even see Spooner Lake below, but you are still much further than you’d like to be from the finish line! To add to the fun, it can feel like a furnace is heating this section of trail, even in the early afternoon. The course says goodbye to the Tahoe Rim Trail as it approaches the Spooner Summit Trailhead on Highway 50. Here the course turns right onto a trail that enters the Spooner Lake Park area. This year there was a water-only aid station at the intersection, with trail angels kindly directing traffic. The distance from Snow Valley Peak to the finish is almost certainly longer than advertised. Race organizers report that it is 5.4 miles from the aid station down to the Spooner Summit TRT Trailhead, plus another 1.7 miles to the finish. I suspect that the actually mileage is more than 6 miles descending, followed by another 2 miles to the finish. After turning off the TRT, the course drops down to the Spooner Lake loop trail, where you go left (clockwise) around the lake. Though the trail is mostly flat, there are a number of speed bumps and it feels anything but flat at this point in the day. You see the finish tent across the lake and it turns out that it is even further than it looks because the trail juts out and back to avoid the wetlands. Luckily, friendly volunteers and great perks await you at the finish line! Continue reading my personal race report below to find out about the great vibe and perks that await racers at the finish. At the start I enjoyed bumping into a number of local runners as well as new friends that I met on the various training runs. Then I was surprised and delighted to find my good friend Kristin and her doting boyfriend Mark. Kristin had been sidelined with knee troubles and I wasn’t expecting her at the race. She has tons of energy and I loved spending the first part of the morning with her (you can see us gabbing away on the race start video just after minute 5:30). Mark and his friends spent the day mountain biking around the race to the various aid stations, and I felt like a rock star with my own crew to fill my water pack at Tunnel Creek! The morning went pretty smoothly until the Red House Loop. The steep descent was not kind to my left foot, which was still recovering from a couple of ankle rolls the month before the race. I just wasn’t able to let go on the downhill in the same way as last year (though when I compare the mile splits they are almost identical!) I am so grateful that my PT Scott Williams got me dialed with KT Tape and that it was holding on great since its Thursday evening application. I was able to tag along with enough other racers to keep me running through most of the Red House Loop and around the Flume until it returned to the steep dirt road. I was just beat and reduced to the slowest hike imaginable. It seemed like a flood of racers passed me and I was struggling to just keep moving up the hill. When I reached the flat section just before the return to Tunnel Creek, I couldn’t help but smile from ear-to-ear… I had ascended from Hell and somehow survived. I sat down and took a 5-minute break at the aid station while Mark kindly filled my water pack. Leaving Tunnel Creek for the second time the course gets a bit lonely. 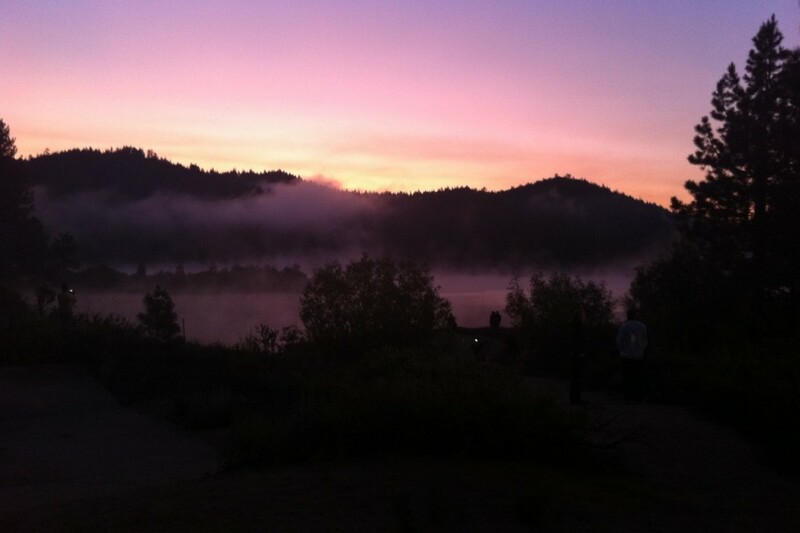 The 50-milers are headed off to Diamond Peak and the hub of activity of the aid station is a quick memory. Having run this part of the course twice already this year, I at least knew what I was in for… a long, gradual climb up to Snow Valley Peak. I hit a second low point for the day somewhere before the Hobart aid station when I saw the antennae on Snow Valley Peak looking like tiny matchsticks in the distance. I’m a painfully slow hiker and I know that speeding up my power-hiking is a great opportunity for improvement in the future. I didn’t really snap out of this funk until I started seeing signs for the the Snow Valley Peak aid station. Ice cold water down my back really perked me up and I cruised strong for the first couple of miles of the descent. Overall I felt stronger finishing than last year, but I could still not run a number of short sections in tyne last 5 miles that I would normally consider runnable. While my finish time may not have lived up to my hopes, my experience at the finish line far exceeded my expectations. It’s always great to cross the finish line, but this finish line was fabulous. First, I remembered from last year that fellow runner (and awesome adventure photographer) Scott Rokis had thought to raise his arms in triumph as my husband snapped his finishing photo. I loved this, and managed the same just in time for hubby to snap a smiley finishing photo. Very happy to finally approach the finish line! I immediately noticed that the race organizers had upgraded the finish area by provided shade and seating for friends and family – what service! But I was primarily focused on one service in particular, the on-site cold shower that I had missed out on last year. (Last year the shower was further removed from the finish area, and I didn’t find out it existed until the next day.) Please note that taking a cold plunge in Spooner Lake is ill-advised as there are leeches – ewww! I entered the finish tent where they checked my age in case I was an age-group finisher (I was not). I was then so focussed on that cold shower that I left the tent without my finisher’s plaque. I’m not so fond of plaques, but I did go back to pick it up when I realized I had forgotten it later. I grabbed the bag that I checked at the start, in which I had packed soap, a towel, clean clothes, and also the race shirt that I picked up in the morning. I then took the most wonderful shower of my life and emerged fresh as a daisy! After a few minutes of staring blindly into space, I realized that I was actually looking at a large group of massage students offering free massages. I put my name on the list and was promptly attended to by two students and their teacher from The Bodhi Tree Center for Healing Arts. Now, I already had a massage scheduled for the next day with super-amazing massage therapist Jen Fluharty of Full Circle Movement in Truckee, and I was hesitant to literally put my body in the hands of students. However, the allure of a free massage was enough to sway me, and I’ll have to say that having the massage so close after the event finish seemed very effective. After some down-time with the kids we returned to the start/finish area to watch our friend Jack come through on lap 1 of his 100-mile race. I really enjoyed this part of the day – soaking up the energy and excitement of the 50-mile finishers as well as the crew and safety runners greeting the 100-milers getting ready to spend the entire night back out on the trail. Many of them would spend a good portion of the next day out there under the hot sun as well. It’s true that I only “dabble” in ultra running. I’ll admit that the marathon is my preferred distance and that I like the idea of completing a race before the heat of the afternoon really sets in. And while I certainly prefer running on singletrack in the forest, I am also happy on pavement so long as the scenery is pleasant. That being said, the 50k distance still works for me – with an early start you’ll be done in time for siesta. So while the number of marathons that I have completed is creeping into the double digits, the Tahoe Rim Trail 50k remains my only ultra – last year and now again this year. As I completed the course just 5 minutes faster than last year, I have spent more than a few moments thinking about the best way to assess my performance. My first thoughts were, “All that training for a mere five-minute improvement? That’s barely one percent better!” It was only a small consolation to find that I at least improved my standing in the field from the 25th percentile to the 20th percentile. Alas, this is a marathoner’s mentality… I have to think like an ultrarunner now! As a couple of days have passed since the race, I’ve come to terms with what I already know: I enjoy training on trail more than racing on trail. I do not have a “race-day monster” that comes out. I rely on solid training, a restful taper, and generally good race-day planning. I enjoyed the two training days that I spent on the course this year more than running the race itself. 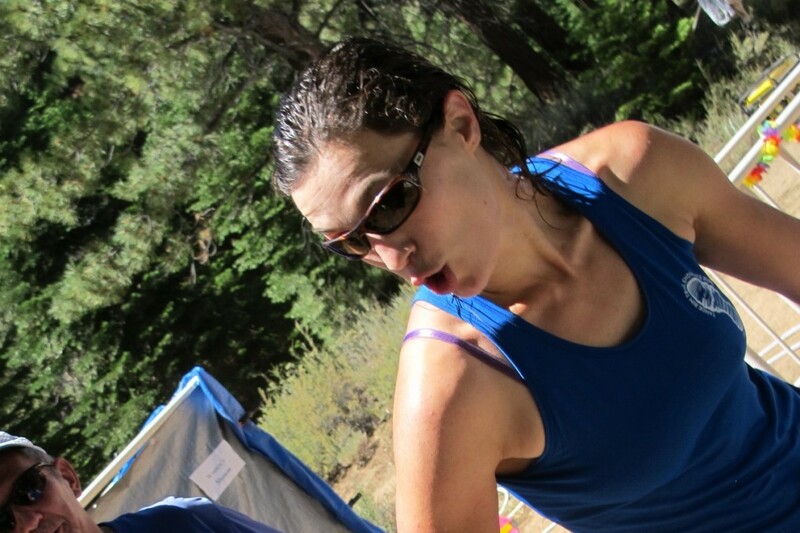 (Click here to read about the great group training runs hosted by the TRT race organizers.) The question left for me to answer is this: would I still train (and enjoy it) if not preparing for a race? Special thanks to my hubby and I’m sorry that you didn’t get to run it this year, but I know you’ll be out there in 2013. I took the second photo and you are in it! Professional job! Effective description of the trail and your race. Great picture of you and your family too! Enjoyed my training run with you. Feeling stronger all the time. I haven’t seen the picture of us from Marlette Peak. Looking forward to running with you again. Thanks for the note and kind words. I will email you photos! Hope everything goes great in Leadville! Hi Heather – It was nice to meet you at the start line, and thanks for taking my picture! Thanks for sharing your report – I really enjoyed reading it. Happy trails! All good! Happy trail to you, too, Donald! Wow – what an adventure!